Introduction - What is Adult Attachment Theory? Introduction – What is Adult Attachment Theory? Adult Attachment theory is currently receiving a lot of attention in the Couples therapy world, as ongoing research provides validation for its basic ideas. These ideas centre around the realisation that the ways in which attachment can go wrong within a couple relationship mimic the ways attachments were formed between caregivers and infants. Predictable & Attentive – The infant forms a secure style of attachment (60% of infants). This leads to so-called “Anchor” behaviour in adults relationships. Predictable but Inattentive – The infant forms an insecure, avoidant style of attachment (20% of infants). This leads to so-called “Island” behaviour in adults relationships. Unpredictable yet Attentive – The infant forms an insecure, overtly anxious style of attachment (15% of infants). This leads to so-called “Wave” behaviour in adults relationships. Unpredictable and Inattentive – the infant forms a disorganised style of attachment (5% of infants). Unlikely to be in on-going intimate relationships as adults. This approach to Couples work follows the logic that adults who learned a particular attachment style (as infants) find this same style being re-enacted in their intimate relationships. This is what we see so often in counselling, as Couples therapists. We see couples where a combination of insecure styles is playing out (categories 2 and 3 above), yet the individuals in the couple are often quite unaware that this is happening. They believe they are having problems with points on which they disagree, but in fact the main issue may be their reactions to their partner’s different attachment style. It’s as though we’re attracted to a particular partner in order to achieve healing of an early attachment wound – yet we’re unable to “stand outside” the ensuing dynamic to get a foothold on how we might change it. 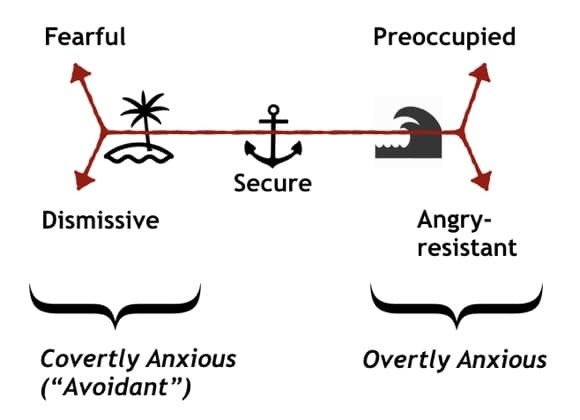 In the diagram here, the attachment continuum (extending from covertly anxious to overtly anxious), is shown on the horizontal axis. Two partners in an intimate relationship can hazard a guess to where they might each fall on the continuum; working with a therapist or taking an online test gives more insight as to where they might each fall. Finding real, experiential ways of making changes so that both partners come closer to the secure, central, position (the Anchor). It’s important to note that the styles usually only make themselves evident in intimate relationships, and then only when one or both of the partners becomes triggered. (The styles appear “when the stakes are high”.) This is why in the “honeymoon” period of a relationship, before there is a high level of commitment, the styles may not be evident. 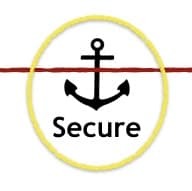 The Secure style is called the Anchor because that’s the function it performs for the two individuals. The relationship itself is providing an anchor for each of the partners in it. At the two ends of the axis in the diagram above are the insecure poles. Individuals feel anxious and insecure at either pole. At the left hand end, the anxiety is covert (having Island behaviour). At the right hand end, the anxiety is overt (having Wave behaviour). Individuals can stay locked in their respective positions for many years, to the detriment of the relationship and the wellbeing of the partners in general. Often, one partner will be at one pole and one at the other pole (we see this a lot in therapy); but this is not always the case. 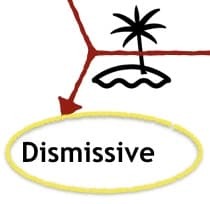 Individuals at the two poles, indicated by the Island and the Wave, process stress in a relationship very differently. The Island styles tend to process internally and self soothe. They prefer to avoid conflict and minimise the intensity and pressure they feel in an argument by removing themselves or withdrawing in some way. They tend to feel better with less closeness, as too much can feel overwhelming. They can seem like a desert island, completely self-contained and needless. Wave styles on the other hand seek closeness, reassurance and intimacy. They tend to try to resolve issues almost immediately and find it more difficult to soothe themselves. They usually like to talk things through and become more anxious when there is little contact. They can be like a wave at the beach, crashing in only to recede soon after. At each pole, there are broadly two different ways in which an insecure attachment can play out, and we’ll touch on these now. In this style, an individual in a couple relationship may become preoccupied with the verbal and/or non-verbal cues they receive from their partner, in an interaction. 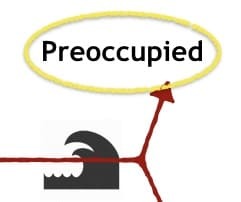 If these cues are insufficient, or non-existent, the individual may remain in a vigilant, aroused state, in the hope, finally, of receiving a response. They will try to regain closeness by initiating conversation, physical contact or other forms of closeness in the hope of feeling soothed and loved. They are not good at soothing themselves after an argument and need a lot of reassurance that they are wanted. If they do not receive this after repeatedly trying they will go into a sense of not being enough. They will feel depressed or deflated. The angry-resistant style has been termed “allergic to hope”. Individuals exhibiting this style anticipate disappointment and failure in relationship, by using negative, angry behaviours (which paradoxically only serve to increase the chance of the outcome they desire the least). 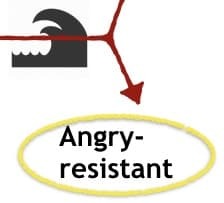 Angry-resistant partners have an extreme need for closeness, to the point that this can seem insatiable to a partner. The exception to this is when they feel rejected, when they become angry and tend to punish their partner. They are acutely aware of the signals they are receiving from their partner (both verbal and non-verbal). They believe their partner should fight for them and they may set up “tests” for their partner in the hope they will prove they love them. If their partner fails these tests they will feel unloved and unwanted and may lash out. In this style the person subscribes to a one-person psychological system. The style is grounded in avoidant body-focussed reactions to early, infantile attachment relationships. The person may be quite unaware of how extreme this can seem to their partner. The person has a reaction to approach by an intimate other, frequently finding this overwhelming and difficult to adjust to. “I want you in the house, but not in my room” (where I can let my internal world play out). The other is dismissed, either by a particular overt behaviour, or merely by being ignored. The other can feel undervalued. These people will tend to feel that they may not be cut out to be in a relationship, and may minimise the importance of the relationship. They can feel pressured by their partner’s desire for information or closeness. On the surface, this style looks like the Dismissive-Avoidant, but the difference is they are fearful of being alone. 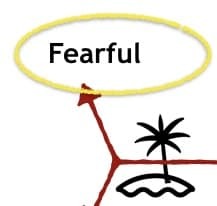 While the Dismissive is more consistency distanced, the Fearful is more “yo-yo”. The Fearful partner may feel they can not get the relationship right; that too much is expected of them. They tend to have fantasies about other situations: being alone, being with an ex-partner or having an idealised version of their current relationship. They can find it hard to stay emotionally committed and present in the relationship. As with any model, this is a simplification of the subtle complexities within a couple relationship, and the unconscious and ultimately mysterious nature by which we bond and/or play out our issues and wounds within relationship. But we’ve seen the model to be very valuable for many couples; enabling shame to be normalised and helping find an opening whereby new behaviours can enter into the relationship, and be tested for effectiveness. What each of them does as a first resort will be painful to the other. The man will dismiss and this will be a strong and negative signal for the woman; the woman will flare up and this will be a strong signal to retreat for the man. What each them does as a first resort will be what the other does as a last resort. The woman, after exhausting all attempts to connect (by coming forward, eventually becoming angry, and hence confusing the partner) will give up and withdraw. The man, after exhausting all attempts to defuse the situation and withdraw (and possibly being backed into a corner), will lash out (either verbally or physically). What they each do first will be what the other does last. Because we often assume that other people’s responses will be same as ours, this couple will be in the unfortunate position of thinking things are worse than they actually are. If they can each realise this (i.e. can gain some awareness of how this happens) they will tend to be less reactive to the first response of the other. Awareness is the first step. It enables both partners to take the reactions of the other less personally. Any new behaviours need to be practiced; and they need to address the here-and-now problems in the relationship, which happen very quickly and, if not questioned, merely serve to entrench the status quo. 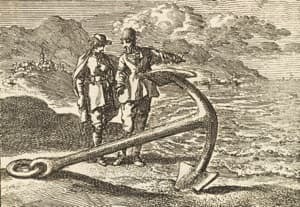 Couple Secure Attachment – Learning How to Use the Anchor! The therapist is able to report on what they see, and in what way that dance is closing down the possibility for new levels of intimacy. And many couple relationships are in a state of waiting – for that potential next level of creativity and intimacy. The image “Lovers Crowning” is a detail from an engraving by Boëtius Adamsz (1590 – 1627). The image of the people with the anchor, talking at the flood line, is a detail from an etching by Jan Luyken, 1711.